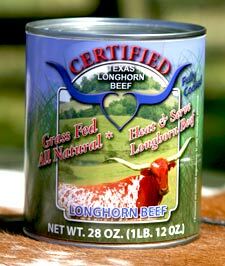 Longhorns Head To Tail Certified Texas Longhorn Canned Beef. No Hormones! No Steroids! No Antibiotics! Grass Fed! 100% USA Product! Born-raised-processed-canned in Ohio-USA! From deep in the Appalachian Foot Hills of Ohio, part of the Midwest known for quality beef, comes now—-hear the sounds of thundering Longhorn hooves—-a new product of Longhorns Head to Tail, LLC. Before electric freezers there was canned beef. It is here again and for a lot of good reasons. Most canned meat is a product of Brazil or China. CTLB is home grown in the good old USA. The ingredients do not include califragiilistic expealodocious or monosodium glutamate, but due to a total grass fed product, it does contain wonderful omega-3, vitamin E, and CLA along with many other great and wonderful natural health treasures. Each large 28 oz. can contains simply, beef & salt. Very slow cooked, the juices are totally retained for a wonderful broth. It is boneless and has a minimum 5 year shelf life without refrigeration. Perfect for emergency provision, even if the electricity goes off. Great for stews or soups—just add your favorite vegetables and heat. Make “sloppy joes” or add barbecue for a tail gate grub of excellence. Enjoy just like fresh roast beef, yet without the preparation time. This price is less than most uncooked roast beef. One can or a pickup load can be purchased at the LHT Store. Place orders with the LTH store info@head2tail.com. Check the site for recipes at www.head2tail.com. Store phone 740 758 5050. Location — 35000 Muskrat, Barnesville, Ohio 43713. Hello, My girlfriend has been eating nothing but your canned beef at all of her meals. Obviously it’s not your fault that she is eating this way as she seems to have a medical condition of some sort that makes digesting foods beyond meat impossible. With that said, her recent departure from eating organ meats has left me concerned that she isn’t getting the vitamins she needs. She insists that even your canned beef has vitamin A in it even though the label does not show it because it is presumed that when the meat was sampled at the lab there was no fat in the sample. Can you tell me whether or not the fat in the can is taken into account when the vitamin levels were measured for labeling? Thanks! Fat is taken into account for our canned beef product. It contains Omega-3 which is a fat. I don’t think that regular muscle meat is known to contain much or any vitamin A. Liver is high in vitamin A. Can you tell me please if the salt you use is sea salt? And whether the beef is processed in a facility that processes anything else, especially any grains, corn, or soy? They just use salt. If you want to get technical, the label “Sea Salt” is a marketing term with no actual meaning. It usually means that the salt is in bigger chunks. It is processed in the same factory as table salt and from the same source. All salt is sea salt. Our processor cans other meat products like pork, turkey, and chicken. As far as I know, there are no grains, corn, or soy processed there.